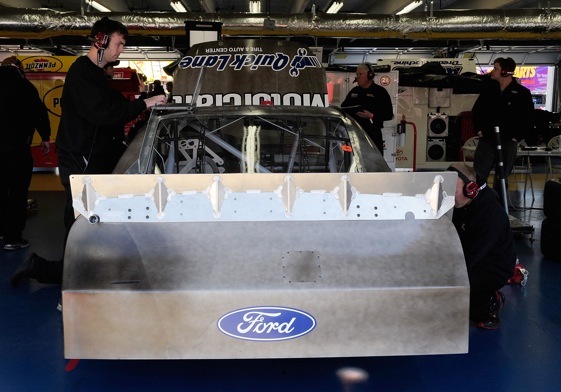 So far, NASCAR’s decision to dump those ugly rear wings in favor of the more fashionable spoilers has been seamless. But nobody really expected the change to make much difference on the half-mile oval at Martinsville, or even the one-mile oval at Phoenix. The drivers and teams are expecting this Sunday’s Sprint Cup race at Texas Motor Speedway to be the acid test. Howard Comstock of Dodge Motorsports Engineering said nobody is really sure what to expect on the fast 1.5-mile Texas track. Ryan Newman, who ended a two-season winless string last Saturday night in Phoenix, echoed Comstock. That’s exactly why most of the drivers are looking forward to this weekend at one of their favorite tracks and to getting some answers about how the new spoilers will affect the 3-year-old Car of Tomorrow on a really fast racetrack. “I didn’t see any evidence at the Charlotte test (last month) that the cars were that much harder to drive (with the spoiler),’’ explained former Texas winner Jeff Burton. “I did think they were a little bit looser on the exit of the corner, but I thought they entered the corner with a lot of security. Having said that, Burton reflected a moment and noted that he actually did pass a lot of cars in Phoenix. Joey Logano, last year’s top rookie and off to a solid start in 2010, doesn’t have much to compare the current car to since he never drove a Cup entry with a spoiler until the tests earlier this year at Talladega and Charlotte. Martin Truex Jr. agreed there are a lot of questions and the teams that find the answers quickest will have a definite advantage. “We’ll definitely see how this new change effects all of us and, obviously, the teams that can figure it out should do well – And I hope that is us,’’ Truex said. Teammate Jeff Gordon, who finished between Newman and Johnson at the front of the field in Phoenix, said, “If we had this big drastic change, you know, I think that that would really throw everybody into a tailspin. A spoiler added to a car that has a greenhouse 4 inches taller than the last spoiler equipped car? Much ado about nothing drivers, and especially fans, will see little to no difference.